Most buyers are ignorant in terms of how much to offer on a home, so I have assembled 5 simple questions that should be answered before formulating an offer. I have found that buyers either want me to provide the guidance on what a home is worth, or worse, they think they can just throw out a low number to get the ball rolling. Nothing could be financially worse for a buyer than failing to ascertain how much to offer on a home, so use these 5 questions and you'll end up with a better deal when buying home. When somebody first starts the process of buying a home, they typically don't have a plan or a negotiation strategy, and I consider it our first job (as professional real estate agents) to help them understand their position in a negotiation. Not all homes are priced the same, not all homes need repairs, and not all price ranges have the same amount of supply or demand in the market, thus the prudent buyer who wants to ensure a successful transaction will start the process to determine exactly where they stand and what they'll need to do. Eventually, whether they are prepared or not, buyers will find "the home" and want to write an offer. They can determine how much to offer on a home with answers to the following five questions. What would this house sell for if you don't buy it? This is the big one. You and your real estate agent can study comparable properties (both ones that are currently for sale and those that have very recently sold) to determine the likely value of a home. If you can buy it at a discount to that price, you are below market, right? So an asking price is either too high, too low, or just right, but it should have no bearing on how much to offer on a home. You can offer lower, right on, or higher than an asking price and still get a good deal, it's all relative to the real value of a home. What would you buy if this house was not for sale? If the next best house is $50,000 more expensive, it could very well impact how much to offer on a home that better fits your price range. Value is relative. It is relative to what else you can buy at the time you need to buy a home. Do seller terms have any value? If the seller is willing to work around your schedule, that is worth something, right? How about a seller willing to pay some or all of your closing costs? If the seller will hold a second mortgage, that's added value too. 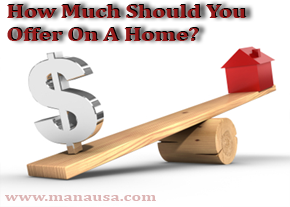 So the terms that a home seller might provide can impact how much to offer on a home. Are there intangibles? Is there something special about a certain area that you've always liked, though you cannot put it into words? Maybe you always wanted to live "north of the river" or "west of the freeway," and only 1 house really fits your needs. Perhaps a house is available on the same street as a family member. All of these might impact your decision on how much to offer on a home. Is there situational value? Finally, is there something happening in your life where ensuring that you purchase by a certain date is critical? Perhaps you have sold a home and need to close on a new one at the same time. Would you pay a few extra dollars to ensure that you do not need to make a staggered move? There are many situations that can occur where "money is not the only concern," when deciding how much to offer on a home. If you take these five questions into consideration, you will find yourself well suited to purchase a home without paying too much. Of course, if you want to know how much to offer on a home in Tallahassee, just drop us a note and we can help you successfully navigate through the home buying process. Do you know the TRUE definition of "Distressed" Property?